Published: Nov. 28, 2012 at 03:03 p.m. Updated: Nov. 28, 2012 at 08:53 p.m.
San Francisco 49ers coach Jim Harbaugh didn't drag out what was left of his team's quarterback drama. Colin Kaepernick is the man going forward. 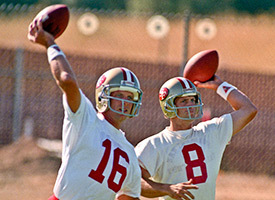 With Jim Harbaugh's announcement that Colin Kaepernick will be his starter, let's take a look at other QB controversies. "We have two quarterbacks we feel great about," Harbaugh said Wednesday. "Both have earned it. Both deserve it. ... What tips the scale, Colin has the hot hand, and we're going with Colin." Responded Kaepernick, via The Associated Press: "I don't know if it's a hot hand. Whatever you want to call it. I'm just happy I get to go back out there. It's a great chance to lead this team and show we're a great team and we can go into the playoffs." We wrote that Kaepernick over Alex Smith was the right choice a week ago, and we feel more strongly after watching him play in last week's win over the New Orleans Saints. Kaepernick was under pressure from the Saints' pass rush for much of the game, but he escaped to make plays. He delivered the ball well in the pocket. The 49ers' read-option plays actually didn't work that great, but Kaepernick was very accurate for a second consecutive start. Harbaugh knows what he has in Smith. The 49ers wouldn't make this move unless they believed Kaepernick had potential to be better. The 49ers are set up to win no matter who starts at quarterback because of their great running game, defense and vastly improved offensive line. "We'll worry about everything and fear nothing," Harbaugh said when asked about scenarios where Smith could play again. Harbaugh was directly asked if Kaepernick was the starter moving forward or just for this week's game against the St. Louis Rams. "I wouldn't assume anything," Harbaugh said. "I know you probably will, but ... I would assume nothing." That's life with Harbaugh's 49ers. We think it's a big reason for his success.